Career Point kota (IIT-JEE/NEET Coaching) observed that performance of a student on a test improves dramatically if he/she has reasonable understanding of the type of the question being asked in examination.It makes the student at ease and allows him/her to take the test calmly without any surplice and stress. This becomes more important in the context of competitive examinations where race is neck-toneck. To understand the format and the kind of questions are asked, Practice Tests play a very important role. 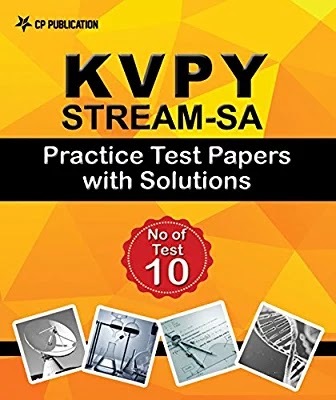 With this objective, we are presenting before you this book containing 10 Practice Tests for KVPY Stream-SA (Kishore Vaigyanik Protsahan Yojana). These Practice Tests enhance student’s speed, accuracy and scoring ability and at the same time improves exam taking temperament. Effectively, these tests give you feel of 'Exam' before the final real Exam. Detailed solutions with answers have been given for better understating. We advised student to take these tests in examination like environment under in specified time limit. Students are advised to properly analyze their solution & think of alternative methods and linkages to the solutions of identical problems also. We firmly believe that the book in this form will definitely help a genuine, hardworking student. We have tried our best to keep errors out of this book. Comment and criticism from readers will be highly appreciated and incorporated in the subsequent edition. We wish to utilize the opportunity to place on record our special thanks to all team members of Content Development for their efforts to make this wonderful book.